The Headmaster’s Wife opening line: He arrives at the park by walking down Central Park West and then entering through the opening at West Seventy-seventh Street. Arthur Winthrop is a middle-aged headmaster at an elite prep school in Vermont. When he is arrested for an act that is incredibly out of character, the strait-laced, married headmaster confesses to a much more serious crime. Arthur reveals that he has had a passionate affair with a scholarship student called Betsy Pappas. But Betsy is a fickle and precocious teenager. When she switches her attentions to a classmate, Arthur’s passion for Betsy turns, by degrees, into something far darker. Now Arthur must tell the truth about what happened to Betsy. But can Arthur’s version of events be trusted – or is the reality much more complex and unnerving? 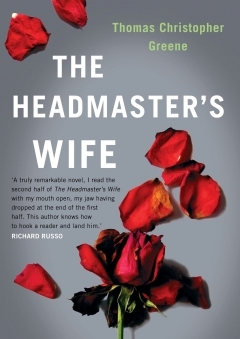 The Headmaster’s Wife is a dark, sinuous and compelling novel about marriage and obsessive love. I want to be kind and generous about this book as it was written when the author was experiencing something sad and tragic, but I cannot. It was written in two different moments in the author’s life, and this is clearly evident by the two halves of the book. The first is written as if we are listening to Arthur Winthrop live his life as an adult, a headmaster of a private school, having an affair with a teenage pupil. The second is the reality – the “pupil” is his wife and the breakdown in his mental state is due to the death of their child. Death of a child is a tragic and one wants to sympathise with Arthur, but his whole mental breakdown comes across in this novel as something sordid. The book is neither well written or worth reading in my opinion. But then I must note that it is labelled as a dark novel, and this is a genre I have no time for given my past review. I persevered with the book and I will note with interest what Dave chooses to do when it is his turn to read it. Dang, what a shame. Ill cross this one of the holiday reading list, thanks for sharing your thoughts Tandy. Really appreciate honest book reviews, nothing worse than settling in, only to find it stinks. Especially if a review is good! Thanks for the honest review. I will leave this one off the list for my book club. Not worth reading at all imo! Aww, Tandy. Reviews require honesty. From this posting, it appears you have been truly honest. Thanks for sharing! Just saw what I wrote – meant really not into dark novels! I will wait and see what Dave says – like you I am really into dark novels, but do occasionally try to read outside of my usual crime, medical crime and the like.